For Muslims, Fatimah is an inspiring example and Fatimah is one of the most popular girl’s names throughout the Muslim world She died a few months after her father’s death, and was buried in Jannat Al-Baqi’, but the exact location of her grave is unknown. Fatimah(R.A) was born in Mecca to Khadija, the first wife of prophet Muhammad(PBUT). The third “Sultan-ul-Faqr” status is adorned by the beloved soul of the chief of all the Qutabs, Abdals and Awliya Hazrat Mahboob-e-Subhani Ghaus-ul-Azam Shaikh Abdul Qadir Jillani Razi Allah Anhu. His grandeur and splendour in the world of Sufism and Faqr does not require any introduction as his dignity and honour is brighter than sun, and his attributes and virtues are countless. Ghaus-ul-Azam Hazrat Shaikh Abdul Qadir Jillani Razi Allah Anhu was born on Friday the first of Ramadan in 470 Hijri (1078 A.D). His lineage goes back to Hazrat Mohammad Sall Allahu Alayhi Wa’alihi Wasallam from faternal as well as maternal side. His father Hazrat Abu Saleh Musa Jangi Rehmat-ul-Allah Alayh was a Hassani Syed and his mother Umm-ul-Khair was a Hussaini Syed. He got the heritage of Faqr from Hazrat Mohammad Sall Allahu Alayhi Wa’alihi Wasallam through blood as well as soul. He was the complete manifestation of the reality of the Divine resplendent innerself of Mohammad Sall Allahu Alayhi Wa’alihi Wasallam. All the virtues and attributes of his holyself were evident from Hazrat Shaikh Abdul Qadir Jillani Razi Allah Anhu. The grandeur of his status was visible since birth. He was born on the night of first Ramadan. The next day was the first fast of Ramadan. He didn’t take motherfeed during the day the whole month and only drank milk after Maghrib and before Fajar prayer. Next year appearance of the moon of Ramadan was doubtful due to clouds. It was the 29th of Shaban. The next day when Ghaus-ul-Azam didn’t take any milk his mother understood that it was the first of Ramadan. Afterwards it was confirmed through reliable witnesses. His son Hazrat Shaikh Abdul Razzaq Rehmat-ul-Allah Alayh states that once his father Shaikh Abdul Qadir Jillani Razi Allah Anhu was asked that when did he come to know that he had got the status of beloved friend of Allah? He answered, “when I was ten years old I used to go to a religious school. On the way I used to see angels around me, when I reached the school I heard them saying “let the beloved friend of Allah sit, leave place for him”. When this happened many times, I was assured that Allah has blessed me with the honourable status of his friend (a Wali)”. Meaning: My foot is over the neck of every saint ! Meaning: Ghaus-ul-Azam Razi Allah Anhu has got the same status among the sufis and saints as Mohammad Sall’Allahu Alayhi Wa’alihi Wasallam has got among the Prophets. Meaning: Ghaus-ul-Azam Shaikh Abdul Qadir Jillani Razi Allah Anhu is the King of both the worlds and the leader of progeny of Adam. All the humans, angels and jins are full of praise for him. Charity during Ramdhan has great rewards! Donation Appeal for a junior (Madrassa) school in Ajmer. The Madrassa ( school ) near the Karin Village in Ajmer is Incomplete. It is the only School in the village. We request & urge all, to please assist by donating towards the final phase & completion of this School. This school will provide local children with teaching whom otherwise, would travel long journeys to the nearest school or be left deprived from essential education. Therefore we call all to make their Maximum charitable donations​ to this noble cause & thus earn blessings. (Sawabe -Daren). You can send your donations and offerings for all causes to via Western Union or Money Gram. If you are unable to do this then we urge you to contact us for further instructions. 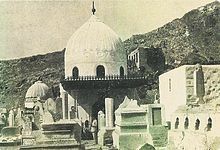 The cemetery has been demolished by forces loyal to the Wahhabi-Saudi alliance in 1806 and around the years 1925/ 1926. At the beginning of the Wahhabis of Najd’s nineteenth century (1806) control over Mecca and Medina, they demolished many of the religious buildings including tombs and mosques, whether inside or outside the Baqi, in accordance with their doctrine. These were razed to the ground and plundered for their decorations and goods. The second demolition was discussed in Majles-e Shora-ye Melli (The National Consultative Assembly of Iran) and a group of representatives was sent to Hijaz to investigate. In recent years, efforts were made by Iranian religious scholars and political figures to restore the cemetery and its shrines.Both Sunni and Shia protested against the destruction and rallies are held annually. The day is regarded as Yaum-e Gham (“Day of Sorrow”). Prominent Sunni theologians and intellectuals have condemned the “Unfit” situation of the al-Baqi cemetery but the Saudi authorities have so far ignored all criticism and rejected any requests for restoration of the tombs and mausoleums. Though nowadays the situation of the Baqi is better than the time of demolition but there is an Acrimonious memory in the memories of the Muslim who visited there in that time. Jannat al -Mu’alla ‘Garden of the Mu’alla’‎, also known as the Cemetery of Ma’la and Al-Hajun, is a cemetery to the north of the Masjid al-Haram in Mecca, Saudi Arabia. It is the place where Prophet Muhammad’s (Peace be upon them) wife, grandfather, and other ancestors are buried. Jannatul Mualla before 1925, during the Ottoman period.